Bald Eagle (by Grizzly) offers one of the best value-priced front rests on the market. We’ve seen F-Class shooters win matches with the Bald Eagle Slingshot Windage Rest, which costs less than a fifth of a premium co-axial rest. For a new shooter, this is a very cost-effective solution. One Forum member purchased the Bald Eagle for his young grandson, deciding it was the best rest under $300.00. All three rests shown offer a cable (with large knob) for easy windage adjustment. The Slingshot model, in cast iron or aluminum, has an elongated front leg for added stability. This also brings the Windage knob within easy reach. The basic aluminum, triangle rest is compact and easy to carry. Note: Front sandbag sold separately. NOTE: This is for Phone orders only. Repeat: You must order by phone to get this offer! Here is a stunning deal. Get a 3-9x32mm Sightron scope — adequate for a basic hunting rifle. Then Graf’s will knock $50 off the price, for a net cost of $99.99. But there’s more. When you CALL in this order, Graf’s will give you TWO (2) 525-round boxes of Federal .22 LR Ammo, a $49.98 value. That’s a heck of a deal. But act soon. This is a limited time offer. And remember, this is for PHONE ORDERS ONLY — call Graf & Sons at 800-531-2666. For a long time Hodgdon H4350 powder has been very hard to find. Now some of our favorite online retailers have H4350 in stock now, in both 1-pound and 8-pound containers. Midsouth Shooters Supply has Hodgdon H4350 8-lb jugs for $191.45 and H4350 one-pound containers in stock for $26.45. Powder Valley has one-pound containers of H4350 in-stock now for $26.55 and the 8-pounders for $189.75. That’s an excellent price. If you want an 8-pounder, we suggest you act quickly. The 9mm Luger (aka 9x19mm) is the world’s most popular centerfire handgun cartridge. Now you can purchase quality, big-name 9mm ammo for under $10 per 50-count box. Choose either the aluminum-cased Federal Champion ammo (115gr FMJ), or the brass-cased Sellier and Bellot ammo (124gr FMJ). We’ve shot both types of ammo and they both functioned well in SIG, Glock, and S&W pistols. Order by the box, or buy 1000 rounds of the Federal 115gr FMJ for $174.90, just 17.5 cents per round. Share the post "Bargain Finder 148: AccurateShooter’s Deals of the Week"
Natchez Shooters Supply is running a big sale on Bushnell riflescopes right now. You can save $60 to $110 off the normal prices. Plus, through the end of March, Bushnell will rebate an additional 30% of the item’s purchase price (in the form of a prepaid credit card). Shown above are four great Bushnell scope deals, but there are many more. Plus the 30% rebate also applies to Bushnell binoculars and Laser Rangefinders, in addition to riflescopes. Howa makes excellent, smooth-running actions, and the Howa HACT 2-stage trigger is WAY better than most domestic factory triggers. Right now you can save big bucks on Howa 1500 barreled actions, complete with HACT trigger and trigger-guard, starting at $279.99. Both regular actions and Mini Actions are offered. Available chamberings include 6.5 Grendel, 6.5 Creedmoor (back-ordered), 7.62×39, .308 Winchester, and .300 Win Mag. Some of these barreled actions come with a rugged Cerakote finish, while others have a blued finish. You can also get FREE Shipping with Code MDV during checkout. But note, this item requires delivery to an FFL-holder. Everything you see above can be yours for just $226.99, after RCBS $100.00 Rebate. Hell of a Deal. Right now, Grafs.com is selling the Rock Chucker Supreme Master Reloading Kit for $326.99. But check it out — this Master Reloading Kit now qualifies for a $100.00 RCBS Rebate (“Buy Green, Get Green”). That lowers your net cost to just $226.99. That an amazing deal considering all the hardware you get: Press, Primer Tool, Scale, Powder Measure, Loading Tray, Reloading Manual and more. Heck, the Rock Chucker press alone is worth $160.00+. NOTE: To qualify for the $100 Rebate you must purchase on or before March 31, 2018. The $100 Rebate is for products costing $299.99 to $499.98. Here is a great combo package that offers complete eye and ear protection for shooters at the range. The Ear Muffs feature a 6-piece noise filtration system that effectively blocks low, mid, & high range frequencies, giving them an impressive NRR 31 noise reduction rating. The muffs ship with a nice zippered case that also holds the supplied safety eyewear. This kit also comes with ten (10) NRR 33 foam earplugs. You can order the kit with either clear eyewear or smoke-tinted lenses. This Norma Match-22 ammunition is good stuff. In many rifles it shoots as well as $8/box products from other makers. But now you can get Match-22 for the equivalent of $4.00 per 50-round box. MidwayUSA is selling 1500 rounds (three 500-round cases) plus an ammo can for just $124.99 with FREE Shipping. That works out to just 8.3 cents per round. If you can’t use that much you can also get 500 rounds for $39.99 (i.e. $4/box), also with FREE shipping. We think you’ll be happy with this ammo. It is a good choice for tactical cross-training, rimfire silhouette, and fun shooting. Here’s an excellent value from our friends at Grafs.com. Lapua 6.5 Creedmoor cartridge brass with Small Rifle Primer and Small Flash-hole is on sale for $99.99 per 100 cases. This is quite simply the best 6.5 Creedmoor brass in the world. It will hold higher pressures, deliver more velocity, and hold up to more reloading cycles. Chances are you will also see more accuracy with this Lapua brass than with other brands. If you shoot a 6.5 Creedmoor, you may want to grab some now. Other vendors are charging a lot more. For example, this very same Lapua brass is $124.99 at MidwayUSA right now. Share the post "Bargain Finder 130: Accurateshooter’s Deals of the Week"
A popular feature of our Shooters’ Forum is the long-running Pride and Joy thread. There you’ll find photos and descriptions of dozens of interesting rifles — from rimfire rigs to big-bore boomers. Forum member Ryan M. (aka “Dieselgeek”) posted a handsome .260 Remington tactical rifle built by Short Action Customs in Wellington, Ohio. The rifle features top-of-the-line hardware. The coated, stainless Alpha 11 action (from Defiance Machine) carries a Bartlein M24-contour 26″ barrel with muzzle brake. The stock is a thumbhole T5A from Manners Composites, fitted with APA bottom metal for AW magazines. On top is a Bushnell ERS 3-21x50mm scope with G2 reticle. Riding on an under-mounted rail is an Atlas bipod with quick-release lever. Share the post "Tactical .260 Rem from Short Action Customs in Ohio"
Save big bucks on Bushnell. Now through June 6, 2017, Bushnell is offering 25% OFF mail-in rebates. Combine that will special sale pricing now at MidwayUSA.com and you can save hundreds on popular optics. For example, the Bushnell 4.5-30x50mm Elite Tactical ERS Mildot scope retails for $979.00. That 25% rebate will save you $244.75, lowering your net cost to $734.25! In addition to riflescopes, the Bushnell Rebate knocks 25% off of Bushnell binoculars, laser rangefinders, spotting scopes, GPS units, and even trail cams. CLICK HERE for Bushnell 25% Rebate details. Now through May 23, 2017 Precision Reloading is running a great sale on all products from Battenfeld Technologies’ well-known brands: Caldwell, Tipton, Frankford Arsenal, Wheeler Accuracy and more. We own a number of these products, such as the Tipton Gun Vise, which has delivered years of great service. We like the Tipton Ultra nickle-plated jags, and the Caldwell “The Rock BR” front rest offers great “bang for the buck”. If you need a carry pistol, now’s a great time to buy. Smith & Wesson is offering a $75.00 mail-in rebate on many of its most popular, compact handguns. In addition, a selection of small S&W semi-auto pistols is on sale now at Brownells.com. When you combine the sale discounts with Manufacturer Rebate, you can pick up an S&W pistol for as little as $239.99 after Rebate. That’s less than half what you’d pay for a Glock. CLICK HERE for S&W Specials at Brownells. CDNN Sports has some of the nicest modern Browning rifles we’ve seen. These deluxe Maple-stocked X-Bolt Medallion Rifles are now on sale for $899.99, marked down from $1519.99. The machine-engraved receiver features a polished blued finish, and is glass bedded into the stock. The free-floating barrel is high-gloss blued, hand-chambered and finished with a target crown. The bolt has a 60° lift and the trigger is adjustable. The stock is a high gloss AAA maple with rosewood fore-end and pistol grip cap. These are very nice rifles that any shooter would be proud to own. This relatively new bench tool does the job very well, and it’s easy to change primer sizes and shell holders. The “feel” of this tool is very good (better than most other bench priming units). If you like to pre-prime cases before using a progressive — this $23.99 Lee Bench Priming Tool gets the job done fast. The tool includes a new folding tray with built-in primer-flipping feature that allows direct filling from common primer boxes. The tool mounting holes are spaced for the Lee Bench Plate system (#006-90251) or the device can be mounted directly to your workbench. REVIEWS by verified purchasers. Share the post "Bargain Finder 86: AccurateShooter’s Deals of the Week"
Barnard Sale Tip by EdLongrange. Every serious gun guy should own a .45 ACP and at least one SIG Sauer pistol. Now you can combine both those “must haves” with an accurate, ultra-reliable SIG P220. This week, the deluxe P220 40th Anniversary model with threaded muzzle as is featured as Cabela’s “Gun of the Week” special. We’ve checked around the web, and this special P220 sells elsewhere for $1060-$1099, so this $799.99 Cabela’s special truly is an exceptional deal, saving you hundreds. This Editor owns two SIG pistols; I can attest that SIG handguns offer class-leading accuracy and reliability. You don’t need to spend big bucks for an effective spotting scope to view mirage. You can get the Kowa TSN-601 Angled Body for just $249.00 from B&H Photo. An eyepiece will run another $275.00 or so. Though relatively inexpensive, the TSN-601 is used by many top marksmen. This doesn’t have the resolution of the $1500+ spotters but this is find for viewing mirage and spotters. The CMP and NRA now allow magnified optics (up to 4.5X max power) in service rifle matches. You can spend thousands on a high-end scope for your AR, but you just might find that a much cheaper optic will do the job. Consider the Bushnell 1-4x24mm riflescope with 0.1 Mil clicks and BDC reticle calibrated for .223/5.56 55-62 grain ammo. Right now at Amazon.com, you can get this 1-4x24mm Bushnell for just $111.99 with free shipping. That’s a steal — this scope sells elsewhere for up to $155.00. And actual scope owners tell us that this very affordable 1-4x24mm Bushnell holds its own vs. competitive optics costing 3-4 times as much. Do you shoot a mid-sized match cartridge, such as the 6.5×47 Lapua, or 6.5 Creedmoor? Then here’s a great deal. Right now you can get 123gr Nosler HPBT match bullets for just $20.49 per hundred. These are “factory seconds” with cosmetic blemishes, such as water spots. But they are otherwise fine bullets, and your targets will never notice the blemishes. Even if you currently shoot another brand of 6.5mm bullets, you should try these 123gr Noslers at just $20.49 per 100. That’s HALF the price of some other premium 120-130gr 6.5mm match bullets. Here’s the best deal going right now on an NRA Life Membership. This normally costs $1500.00, but if you CLICK HERE, you can get a life membership for just $600.00, thanks to an NRA/MidwayUSA promotion. You can also save on 1-year, 3-year, and 5-year NRA memberships. Note: This is a limited-time offer. Share the post "Bargain Finder 78 — AccurateShooter’s Deals of the Week"
Looking for a great job in the Shooting Sports industry? Well Vista Outdoor, America’s largest firearms/ammo/optics/sporting accessories maker, has some key job offerings. Vista Outdoor (formerly the sporting unit of ATK) is a corporate giant operating dozens of major brands including: Alliant Powder, Bushnell, CCI, Federal Premium, RCBS, Savage Arms, Simmons, Speer, and Weaver. Position is responsible for managing all aspects of product development, from concept development to commercialization, for firearms product categories. He or she will aggressively grow the business by thoroughly understanding the marketplace, competition and by developing products that address global consumer and retailer needs. The Senior Marketing Manager for Firearms at Vista Outdoor will have full responsibility for all marketing within the Firearms Global Product Lane. This position will report to the V.P. of Marketing and New Product Development for Shooting Sports. This position will manage all aspects of consumer marketing for all firearms brands. Vista’s Overland Park, KS location is seeking a Senior Product Manager — Optics to add to our team. The Senior Product Manager is responsible for managing all aspects of product development from concept development to commercialization for our line of Sports Optics. The Product Manager will achieve annual top and bottom line metrics through new product development in support of the global tactical strategy. This position will be responsible for leading all aspects of R&D, concept and product development, commercialization, and launch. This role will work alongside Product Development Engineers, Product Marketing and Insights Staff, members of the Product Innovation Team and will map out and pursue future new products for Vista Outdoor Shooting Sports Ammunition Company. In addition to the positions presented above, Vista Outdoor currently lists over 70 more job opportunities on its corporate Careers webpage. Vista Outdoor is headquartered in Utah and employs approximately 5,800 workers. Current Vista Outdoor opportunities include: Project Manager III, Legal Business Manager, Purchasing Manager, Export/Import Specialist, Senior Tax Analyst, Pistol & Rifle Product Line Specialist, Senior Database Developer, Manufacturing Engineers (I, II, III), Financial Analyst, Environmental Lead, Community Relations Specialist, and many more. Share the post "Vista Outdoor is Hiring — Many Good Jobs Offered"
You may not have heard of Vista Outdoor (NYSE: VSTO), but you’ll know many of the brands under its corporate umbrella: Alliant Powder, Blackhawk, Bolle, Bushnell, CCI, Federal Premium, Outers, RCBS, Savage Arms, Simmons, Speer, Weaver. To learn more about Vista Outdoor’s operations and products, visit www.vistaoutdoor.com or Vista Outdoor’s Facebook Page. So what is Vista Outdoor? This corporate giant used to be the sporting division of ATK (Alliant Techsystems*). In February of this year, ATK split into two separate companies. The outdoor sports/hunting/shooting brands (with annual revenues of $2.3 billion) were consolidated into Vista Outdoor. The aerospace/military contract operations of ATK were continued in a second company, Orbital ATK. Vista Outdoor, now head-quartered in Clearfield, Utah, is a standalone, publicly-traded outdoor sports and recreation company with approximately 5,800 employees worldwide. Q: Looking ahead for this year, what to-be-released products are you most excited about? Vista Outdoor Inc. (NYSE: VSTO), which previously operated as the Sporting Group of Alliant Techsystems Inc. (“ATK”), announced today the successful completion of its spin-off from ATK (NYSE: ATK) into a standalone, publicly traded outdoor sports and recreation company. On February 9, 2015, ATK distributed to its stockholders two shares of Vista Outdoor common stock for every share of ATK common stock held as of record on February 2, 2015. Vista Outdoor common stock will begin “regular-way” trading under the symbol “VSTO” on the New York Stock Exchange (“NYSE”) today, February 10, 2015, when markets open. Vista Outdoor is a leading global designer, manufacturer and marketer in the growing outdoor sports and recreation markets. The company operates in two segments, Outdoor Products and Shooting Sports, and has more than 30 well-recognized brands that provide consumers with a wide range products in the ammunition, firearms and outdoor accessories categories. Vista Outdoor is headquartered in Utah and has manufacturing operations and facilities in 10 U.S. States, Puerto Rico, Mexico and Canada. Share the post "Vista Outdoor — Parent of Bushnell, CCI, Federal, Savage & More"
Our friends Ed and Steve, aka the 6.5 Guys, were in Las Vegas last week, checking out new products at SHOT Show. On Day 2, Ed and Steve tracked down some cool products from Bushnell, McRee’s Precision, Timney, and TargetVision. Here are Ed and Steve’s Show product preview video reports. You can see more SHOT Show videos by Ed and Steve at 6.5Guys.com. Laser RangeFinder with BlueTooth: Here Bushnell showcases the brand new Elite CONX Rangefinder. Using a Bluetooth connection, this “networkable” rangefinder can communicate with a smart-phone (and certain Kestrels). This allows you to push range/angle data directly into a ballistics App on your phone. We will certainly see more of this kind of inter-device connectivity in the future. The CONX can work with both iOS (Apple) and Android OS devises. Chassis Systems and Prefit Kits: The 6.5 guys interviewed Top Shot Season 2 Champion Chris Reed at the McRee’s Precision booth. McRee’s offers chassis systems as well as turn-key pre-fit barrel kits using Criterion barrels. Chris Reed reviews the “Remage” pre-fit barrel system for Remington actions at 5:25 in the video. New Double-Sear Trigger: The 6.5 Guys checked out Timney’s new “Calvin Elite” double-sear trigger. This versatile trigger adjust from 8 ounces up to 2.5 pounds. It allows you to shoot a rifle with a low trigger pull weight for competition, then raise the pull weight to 2.5 pounds for field use or hunting. Wireless Target Camera: If you want to see bullet holes reliably, in all conditions, past 400 yards, you need some kind of digital camera system, preferably wireless. TargetVision sells a reliable system that works through common WiFi technology, so you can view your shooting session on a smart-phone, iPad, or Android tablet. The TargetVision system includes proprietary software that can highlight the last shot fired. You can even take snapshots or record videos of your shooting sessions. Share the post "SHOT Show: Bushnell, McRee’s Precision, Timney, TargetVision"
Alliant Techsystems (ATK or Alliant) is merging its aerospace/defense operations with Virginia-based Orbital Sciences. At the same time, ATK plans to spin off its sporting arms, ammo, and outdoor gear operations into a separate, stand-alone business. ATK sells sporting products under numerous brands including Alliant Powder, Blackhawk, Bushnell, CCI, Champion, Federal Premium, RCBS, Savage Arms, Speer, and Weaver Optics. The new Alliant sporting business will operate from Utah, while the merged Orbital-ATK aerospace business will be managed from Virginia. The announced merger of Alliant and Orbital, and the spin-off of the sporting business, should benefit Alliant shareholders. Alliant shares rose 8% yesterday. Alliant shareholders will own 53.8% of the new Orbital-ATK aerospace company, and Alliant shareholders will retain full ownership of the new spin-off sporting enterprise. Alliant’s current CEO and president, Mark DeYoung, will take over as chairman and CEO of the new sporting business. Will the new Alliant Sporting operation continue to grow? Analysts believe that it will. Management has shown interest in building the company via more sporting industry acquisitions. Analysts believe the Alliant sporting division is poised for continued expansion. While Alliant’s aerospace operations have suffered in recent years from cuts in defense spending, the sporting division has seen impressive revenue growth. Under the terms of the transaction agreement, ATK will distribute ownership of Sporting to ATK shareholders in a spin-off transaction, following which, ATK shareholders will own 100 percent of Sporting. The spin-off will be immediately followed by a merger of Orbital with a subsidiary of ATK, with Orbital surviving the merger and becoming a wholly owned subsidiary of ATK. In connection with the merger, Orbital shareholders will receive 0.449 shares of ATK common stock for each share of Orbital common stock that they hold. Upon the closing of the merger, ATK shareholders will own approximately 53.8 percent of the combined company on a fully diluted basis and Orbital shareholders will own the remaining approximately 46.2 percent of the combined company on a fully diluted basis. Share the post "ATK Spins Off Sporting Businesses and Merges Aerospace Operations with Orbital Sciences"
It’s official — ATK is acquiring Bushnell — for a whopping $985 million. ATK (Alliant Techsystems) has executed a definitive agreement to acquire Bushnell Group Holdings, Inc., a leading maker of branded sports optics, outdoor accessories, and eyewear. In addition to rifle scopes, Bushnell makes rangefinders, binoculars, spotting scopes, GPS units, sunglasses, and more. Bushnell sells a myriad of other products for outdoorsmen through its brands Simmons, Tasco, Millet, Butler Creek, Bollé, Serengeti, Hoppe’s, Night Optics, Primos, Stoney Point, Hoppe’s, and Uncle Mike’s. Under the terms of the transaction, ATK will pay $985 million in cash, subject to customary post-closing adjustments. Bushnell’s projected sales for calendar 2013 are approximately $600 million. ATK will finance the acquisition through a combination of $900 million of secured financing, borrowings under its existing revolving credit facility, and cash on hand. The transaction is subject to regulatory approvals and customary closing conditions. ATK anticipates closing the transaction in the third or fourth quarter of its Fiscal Year 2014. Bushnell markets 19 outdoor brands in sports optics, outdoor accessories and performance eyewear, including the Bushnell brand and other notable brands such as Primos, Bollé, Hoppe’s, Uncle Mike’s, Butler Creek, and Serengeti. Founded in 1948, Bushnell is headquartered in Overland Park, Kansas and employs approximately 1,100 workers worldwide. 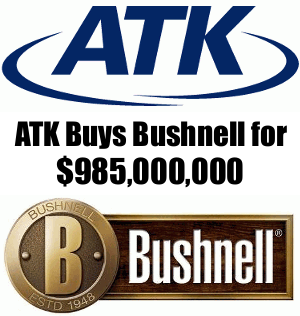 ATK will integrate Bushnell into its Sporting Group within its existing accessories business. ATK Sporting Group’s ammunition brands include Federal Premium, CCI, Fusion, Speer, Estate Cartridge and Blazer. ATK’s accessories brands include Alliant Powder, RCBS, Weaver Optics, BLACKHAWK!, Champion, Outers, and Gunslick Pro. In June 2013, ATK acquired Savage Sports Corporation, adding centerfire and rimfire rifles, shotguns and shooting range systems used for hunting, competitive and recreational shooting to its product offering. 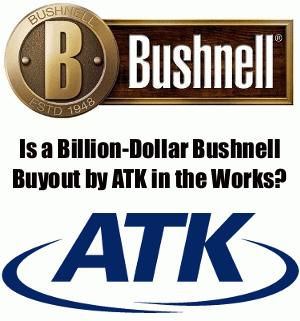 Share the post "ATK Acquires Bushnell Group Holdings for $985 Million"
Bushnell Outdoor Products has introduced a new compact, roof prism spotting scope. The new Bushnell Elite Tactical 8-40x60mm Lightweight Modular Spotting Scope (LMSS) features a rubber-armored housing, ED Glass, and an optional (extra cost) H32 ranging reticle. A Picatinny rail is supplied that fits to the bottom of the LMSS. The Elite Tactical 8-40x 60mm LMSS features ED Prime glass, BAK-4 prisms and fully multi-coated optics. The LMSS is available in both a standard (clear view) model or with the Horus Vision H32 reticle, a highly-regarded ranging reticle. 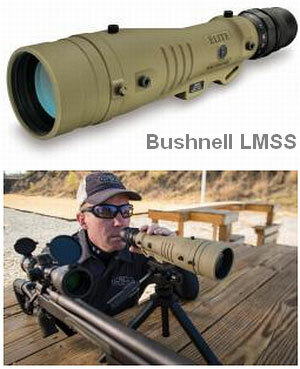 With a minimum 8X magnification, and a maximum of 40 power, the LMSS is extremely versatile. Sheathed in rubber armor, the LMSS spotting scope is fog-proof and meets IPX7 waterproof standards. It also features the water-repellant RainGuard HD lens coating, a patented Bushnell technology that we have found works very well. The spotting scope includes a detachable picatinny rail, giving users the ability to quickly and easily mount the spotter to a firearm or tripod system. The Elite Tactical 8-40x 60mm LMSS is available for an estimated retail price of $1699.99 or $2,199.99 with the Horus H32 reticle. Every product in the Elite Tactical series is covered by the Bushnell limited lifetime warranty. The entire product line is also backed with the new one-year, no-risk Bushnell Bulletproof Guarantee. The 100% money-back guarantee is valid up until one year from date of purchase. 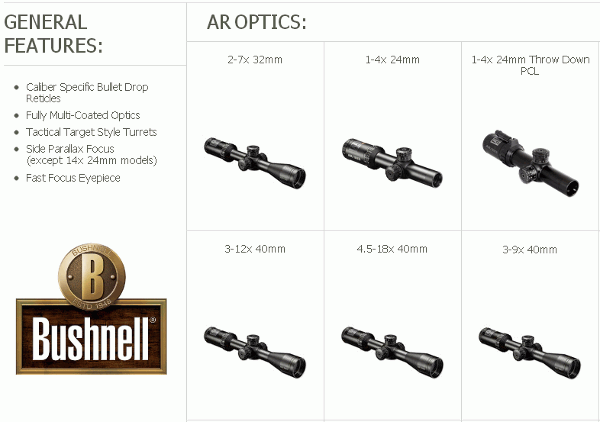 Share the post "New Bushnell Tactical Spotting Scope with Optional H32 Reticle"